In this Lucie Build Guide, we provide an overview of her strengths, abilities, Battlerites and matchups. Lucie is undoubtedly one of the most challenging Champions to play. Relying solely on a single Panic and shield, she spends the majority of any match playing cat and mouse with the opposition. Reliant on perfect positioning, while still trying to keep her team alive, Lucie has an incredibly high skill ceiling. Miss a single ability, or stand in the wrong place at the wrong time, and you can die near instantly. Lucie is a highly skilled Alchemist. A rebel at school who got expelled from the Toleen Academy for mixing banned potions. She is a diverse contender who knows which brew makes you choke, heal or flee in fear. The arena has become her new playground for wild experiments. Seeing her smile while mixing ingredients of an unknown nature might make her look more crazy than cute. Even worse, being so heavily reliant on Panic Flask in order to buy yourself time means any enemies who happen to avoid it, or worse - deflect it - can punish Lucie incredibly quickly. Despite this, Lucie is a rewarding Champion to play and one that can excel in 3 versus 3. Toxic Bolt (LMB) - Toxic Bolt has two purposes. The first is to apply immediate pressure from afar, while the second is to then pressure through its Toxic damage over time effect. By default it doesn’t hit hard, but this does add up once the DOT is factored in. Ideally you want to apply Toxic Bolt to as many opponents as possible, and not worry too much about constantly attacking. By all means fire away with Toxic Bolt if you can, but don’t ignore supporting your team. I’ll also add that Toxic Bolt has a fairly slow cast time, so try to factor this into account when leading your shots. Healing Potion (RMB) - Healing Potion heals for a flat value, and applies a heal over time. By default it’s a strong heal and superior to that offered by Oldur. That said, with Healing Potion only having three charges, you cannot afford to repeatedly spam it. Ideally you want to cast it often enough to keep health topped up, but without spamming it (that’ll leave you and your team vulnerable to burst). I’ll also add that once you’ve healed an ally once, allow your heal over time to do its stuff. Spamming a heal again, when Revitalize could cover the health loss, is fairly inefficient. Barrier (Space) - Barrier is one of the strongest abilities in the game because it provides a huge amount of single-target shielding. Castable without vision, Barrier can mitigate huge amounts of incoming damage. It also buys Lucie some breathing room to heal others, or wait for her heal to come off cooldown. I must stress that it’s incredibly important not to waste Barrier as it’s your only form of real defence and when it’s on cooldown, that leaves only positioning, self healing or Roll to survive. Against a heavy melee composition, there’s no mistaking that without peels or Barrier, Lucie is quickly killed. Only use it when under immediate and massive pressure. Clarity Potion (Q) - Clarity Potion is incredibly potent and its value isn’t immediately apparent. While the knockback is small, it does provide a moment of pause for Lucie. The value of Clarity Potion however is in its ability to remove buffs from opponents (such as Rook’s berserk) or to cleanse herself of status effects. Used at the right time, Lucie can instantly cleanse herself (by taking account of the fact the potion is thrown up, before landing), while also ensuring her team remain mobile and debuff free. With a fairly lengthy cooldown, I wouldn’t use Clarity Potion just for the knockback alone. Panic Flask (E) - Panic Flask is Lucie’s most valuable ability and is key to her surviving. Without Panic Flask, she has to solely rely on Barrier and positioning. While this can keep her alive for some time, it won’t stop relentless melee Champions such as Rook or Raigon. With Panic Flask inflicting Panic for 2 seconds, it allows her to not only escape but also regain other cooldowns. Combined with positioning, Barrier rotations and Clarity Potion, effective use of Panic Flask can see her survive for long periods of them. The only thing you need to be careful of this the fact it has a very clear animation. Be sure to cancel cast regularly so your opponents waste their defensive abilities. Roll (R) - Costing 25 Energy, Roll allows Lucie to instant create space between her and her opponents. It’s not always needed, but it does allow you to evade incoming attacks as it acts as an i-frame. Just be conscious of where you’re rolling to, and ideally, ensure it’s towards your team or scenary so you can deny line of sight. Deadly Injection (Shift + LMB) - Deadly Injection is Lucie’s only means of real damage, allowing her to slow the movement speed of opponents and deal 24 damage when the effect ends. Ideally you want to use it when you’ve inflicted Panic on an enemy, as it guarantees you can reliably land Deadly Injection for reliable burst. If you can, once you’ve landed Deadly Injection, reposition and apply your Toxic Bolt to other opponents. Petrify Bolt (Shift + E) - Petrify Bolt is a sexed up Panic Flask and allows Lucie to petrify an opponent for 3 seconds. When you need to reduce the number of active opponents, or to simply buy more time than Panic Flask, Petrif Bolt works exceptionally well. In most instances however, Petrify Bolt works best when you want to shut down an opposing Support Champion. This buys your team significant time to burst an opponent, or at the very least eat a chunk of their health. Crippling Goo (F) - With Lucie gaining Energy so quickly, Crippling Goo is regularly available. Whether it’s used for area denial, cast at your feet to prevent others attacking you, or to simply kill enemies trapped by it, Crippling Goo is undoubtedly strong. If you can use it when an opponent has used their defensive abilities, it’ll guarantee that Crippling Goo deals maximum damage and unless that enemy receives a shield, they’ll likely die or be close to death by the time they make it out. Allowing Lucie to reduce the healing of an opponent by 20% and their damage by 10%, Weakening Toxin boosts the value of your basic attack, while ensuring anyone under the effects of its poison is significantly weakened. While the debuffs don’t sound huge, they do ensure Lucie and her team need less healing, and can burst for more on an infected opponent. By default Lucie’s heal, heals for a good amount. However, Companion Potion bolsters this by increasing the value by 4. This allows Lucie to keep her team up easier, while also requiring her to heal less frequently (especially when she’s under attack). Variable: If you don't anticipate high burst, take Alacrity (Barrier Battlerite). It offers Lucie or an ally 33% increased movement speed when under the effects of Barrier. Alacrity provides Lucie with much needed mobility and ensures anyone on her team who dives too deep, can retreat at incredible speeds. Lucie’s Barrier already offers amazing shielding, but Siege Barrier increases this even more, increasing its shielding by a further 8. Not only that, but it elongates the duration by 0.5 seconds, allowing her or her team to maxmize its use. As Panic Flask will only detonate when it directly strikes a target, Chaos is often a valuable Battlerite to take. The explosion Chaos causes allows Panic Flask to affect multiple opponents, causing a Lesser Panic, while dealing 8 damage. When your aim isn’t quite perfect, or you want to split a group, Chaos is a must. With Lucie having little mobility, Agility allows her to kite that little bit easier and escape opponents that little bit faster. The 10% movement speed bonus isn’t huge, but it does ensure she can escape when needed. These Hero Threat Levels (1 being lowest threat and 10 being highest threat) are to help you determine which enemy Heroes can give you a headache. For the Heroes listed here, take extra care as they're particularly dangerous for Lucie. Ezmo: His speed, and his long ranged poke makes him a challenge. He can easily evade Panic Flask while often silencing you. 1. Always position yourself on the edge of all fights, preferably at maximum distance. 2. Try to stand near scenery so that you can use it to kite or block shots from opponents. 3. Your role isn’t damage, it’s supporting your team. Use Toxic Bolt when you can, and once it’s applied turn your attention back to helping your team. 4. There's no harm in refreshing the duration of Toxic Bolt, but don't do this over healing or protecting an ally. 5. Try to cast Toxic Bolt on a high value target, to trigger the reduced healing and damage effect. 6. Healing Potion only has 3 charges. Make use of its healing over time, but don't spam heal just to top up a very small amount of health. 7. If you maintain line of sight with your team, you gain cooldown reduction on your Healing Potion. 8. Try to lead your shots with Healing Potion. It's still easy to miss against fast moving Champions. 9. Barrier provides absolutely massive shielding. Don't waste it just to protect an ally from basic attacks. 10. Use Barrier on yourself when Panic Flask has failed, or if you're being attacked by multiple foes. 11. Feel free to cast Barrier on a team mate if they're diving deep, just be sure to stand far back in the event you're then dived. 12. If both Barrier and Panic Flask are on cooldown, stay at maximum distance near scenary. You can then retreat to cover, and kite most enemies with ease. 13. Use the air time of Clarity Potion to cleanse yourself the moment an effect hits you. For example, if you know Rook is about to Rush you (which causes a stun), throw it in the air on top of yourself. By the time Rook lands against you, the potion will land and remove your stun. It takes practice, but clever use of Clarity Potion in this way works wonders for Lucie. 14. Always bait with Panic Flask. If you know your opponent has their defensive abilities, don't try to cast it fully. Wait till they waste theirs. 15. Sometimes you can get away with saving Panic Flask by using Barrier. This then buys you time to reposition, before using Panic Flask. This way you can create a lot of space, and return back to your team. 16. Never Roll out into open space, and always try to Roll towards your team mates. Lucie out in the open, is an easy target. 17. Panic Flask sets up a perfect Deadly Injection. Thanks for reading our Lucie guide! 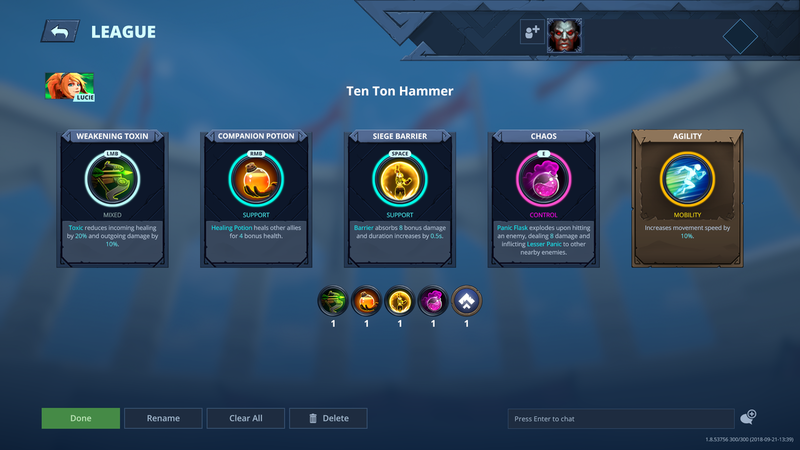 You can now help support Ten Ton Hammer, so we can keep writing guides like this. Thanks for reading our Lucie build guide. You can help support its updates by subscribing to Ten Ton Hammer. Here's the details.